Warning: Manufacturer suggests for 3+ age kids as it's painted. Please NOT buy for kids who may have chance to put into mouth. Again please NOT buy for LITTLE kids. Products pass ASTM test. This is UPDATED, NO MORE Paint OFF. 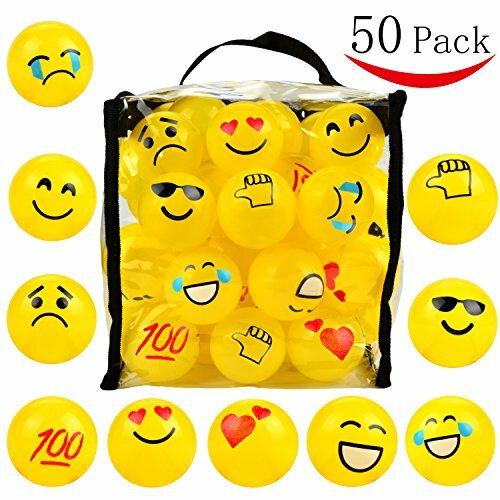 EMOJI PIT BALLS - Special Pack of 50(2.2 inch) ball pit. 10 emoji designs. Add more fun to ball pit. KIDS SAFE - Each ball will withstand over 90lbs of weight. Crush Proof, Phthalate Free, BPA free, Lead free. Safe for all 3+ years old to play. GREAT FOR - filling any ball pit, tent, play house, kiddie pool playpen and bounce house. Also great for Find Hidden Objects Game when they're mixed with other plain color pit balls. This is UPDATED version. No more paint off. Notice: Manufacturer suggests for 3+ age kids as it's painted. Please not buy for kids who may have chance to put into mouth. Again please NOT buy for LITTLE kids. Products pass ASTM test. SATISFACTION GUARANTEE - BUY it NOW! If there is any issue that makes you feel unhappy about our product, we promise you a 100% money refund.